256k JPEG. Viewed from south c.1995. At 456 metres (1498 feet) above sea level, Winter Hill is the highest point of the area to the west of the Pennines, a line of hills, known as the backbone of England, running roughly north - south between Lancashire and Yorkshire. 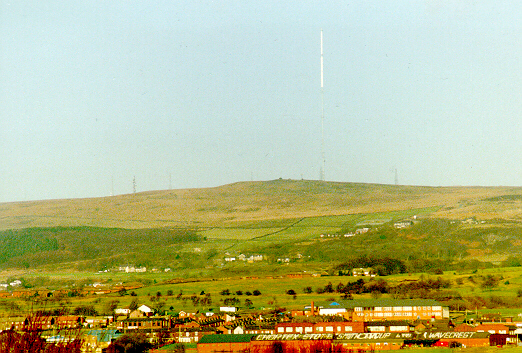 The highest point within Bolton Borough is on Smithills Moor, south of the top of Winter Hill, at 1467 feet above sea level. There is a list of transmitting frequencies at the bottom of this page. It is said that the name originates from 'Wintly Hold', in the 13th century it was written Wintyrhold and Wintyrheld. It could also easily have come from Old English Wynter and Hyll. It has been noted that it has also been known as Egberden, for both the hill itself and the valley of the Deane Brook. The pike was used as a beacon, a bonfire built and lit at night that can be seen many miles away, Ashurst's Beacon being another 'relay' site for this chain of signals. In clear weather it is possible to see Pendle Hill, north of Burnley, Snowdon, a mountain in North Wales, the edge of the Pennines, and Blackpool Tower from the Pike. 100k. View of the masts April 1996. Sandstone was quarried from the hill for paving stones, primarily used in Manchester, Salford and Eccles between 1880 and 1920. Some of the stone was also used for the roads in Rivington, the quarry now long since closed. Millstone Grit was the name of the stone quarried, from the Montcliffe Quarries. Below Montcliffe is Wallsuches. A prehistoric tumulus, lying 0.5 km (1/3 of a mile) west of the summit was discovered on March 24th 1957 by John Rawlinson and Tom Creear. It was excavated by Mr C.E.P Rosser of Manchester University on August 6th 1958. He described it as a Bronze Age barrow, 2.5 metres (8 feet) in diameter 1.5 metres (5 feet) high and contained pollen that was carbon dated to 1500 bc This tomb is encircled by a low wall 0.6 metres (25 inches) high and 19 Metres (63 feet) in diameter. It appeared to have been previously excavated about 250 years ago. 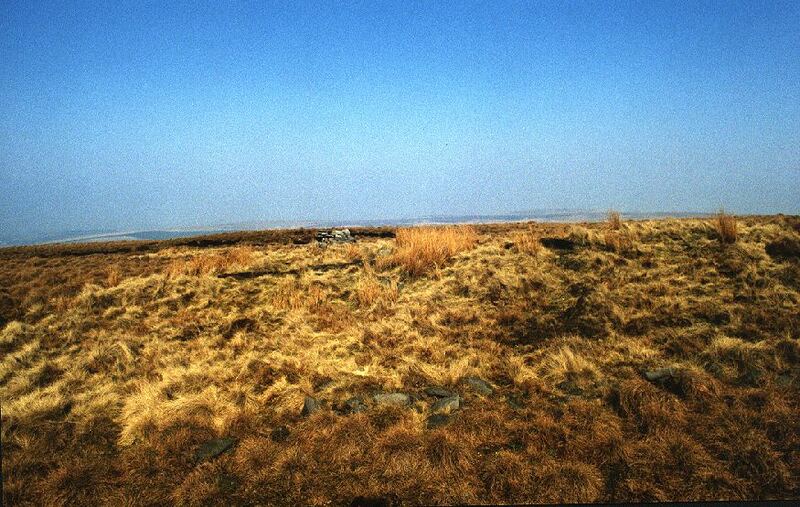 The barrow, known as Winter Hill Barrow, was thought to be for an important personage who lived and died in the area. 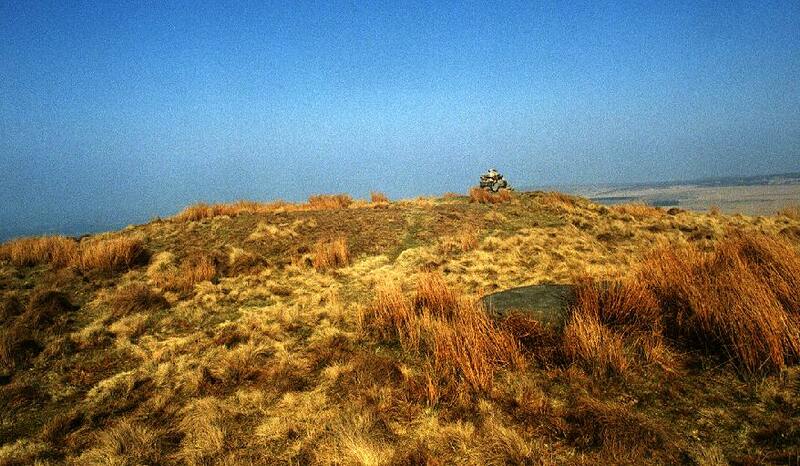 Another feature 1 km (3/4 mile) west of the summit is a similar burial mound known as Noon Hill Saucer Tumulus. Two concentric circles of stones, 16 metres (52 feet) and 10 metres (33 feet) in diameter, forming low walls, covered with turf. Excavation by the Bolton Archeological Society in August 1958 revealed in the centre 2 metres (6 feet) above the hill, the burnt remains of two humans' bones, and a broken pot urn containing more burnt bones. The Cinerary Urn has been reconstructed and is exhibited in the Bolton Museum. Also found were two flint arrowheads and a sacrificial flint knife with one serrated edge and a sharp cutting edge. The mound and contents are dated at around 1100 B.C. A coal mine also used to exist on Winter Hill, but closed in 1896. The Liverpool Corporation Waterworks built Rivington reservoir, which supplied water to Liverpool from 1857, and Yarrow reservoir followed in 1877. From Douglas Spring starts the River Douglas on its way down through Wigan lying in the Douglas Valley. Scotchman's Stump is a memorial for George Henderson, a traveller who was murdered on the moors in 1838. This metal stump replaces a wooden stump which was whittled away by visitors. A fascinating film is available, recreating the scene and examining the evidence, from www.reelvisionfilms.co.uk, produced in association with David Holding who has written the book titled "Murder In The Heather". Not only does it provide an insight into the event, it shows the forensic evidence of the time and court process. 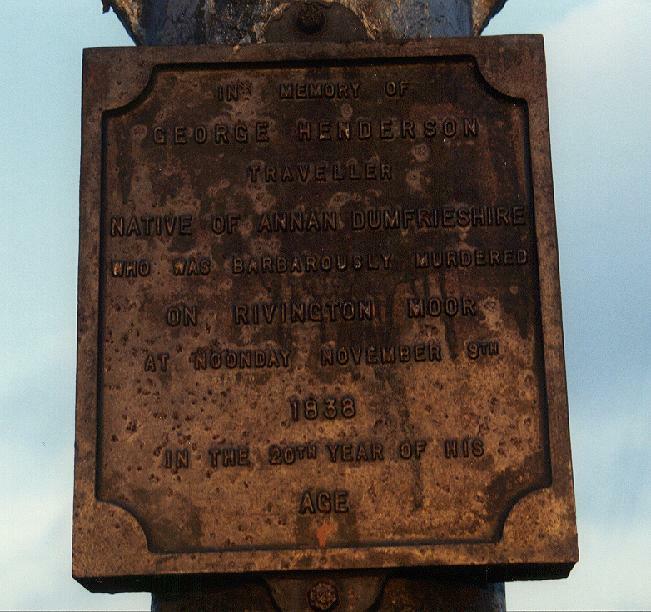 It reads: In memory of George Henderson traveller native of Annan Dumfrieshire who was barbarously murdered on Rivington Moor at noonday November 9th 1838 in the 20th year of his age. 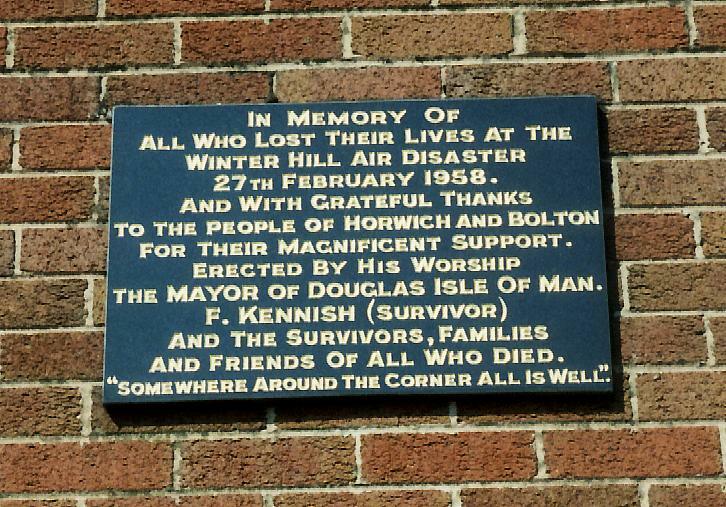 A Bristol 170 plane crashed on Winter Hill in thick fog from the Isle of Man on February 27th, 1958, killing 35 people, 7 survived. The plane was carrying businessmen from the Isle of Man to an exhibition in Manchester. 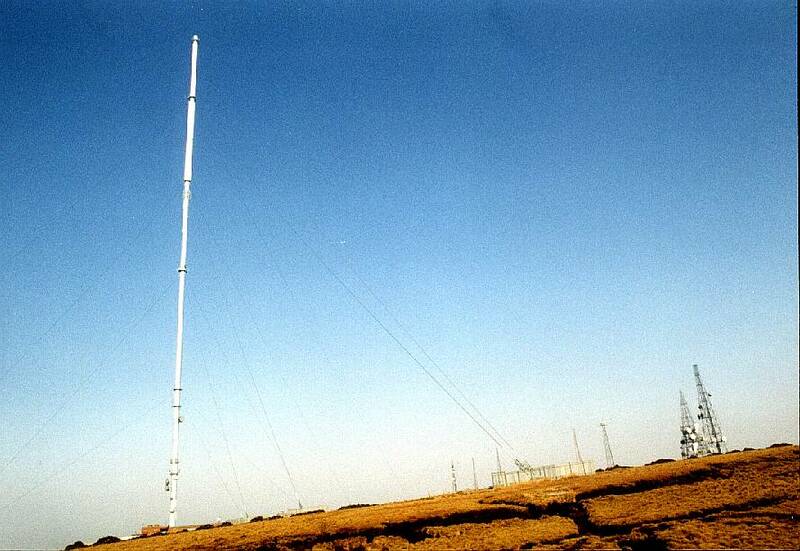 Winter Hill is home to a main television transmitter, radiating regional and national TV programmes on the UHF band in 625 line PAL in Nicam digital stereo, relays for national FM stereo radio, regional FM stereo radio and a local FM stereo transmitter. The mast is 1015 feet high, was built by the Independent Television Company for Granada Television, and now owned by National Transcommunications. There are also many microwave link dishes and other private transmitters on this site. Channel 4 - UHF channel 65 500kW. A digital national terrestrial TV service has also started broadcasting from Winter Hill called onDigital. The BBC stations also use EON - Enhanced Other Networks in the RDS - Radio Data System. National stations carry information as to which locals have TP - Traffic Programme flag set, thereby allowing suitably equipped receivers to select automatically local programming when travel information is being broadcast. The network also supports and carries data for News and Info, as well as CT generated from Greenwich.